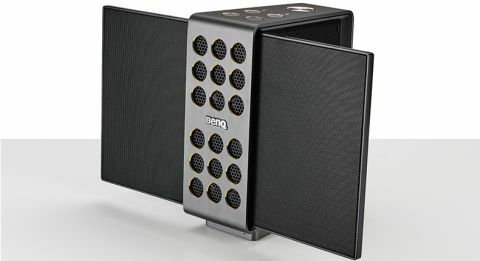 BenQ treVolo review | What Hi-Fi? You have to admire BenQ's confidence. If the treVolo isn't the best Bluetooth speaker you've ever heard, says their website, you can send it back for a full refund. Now that seems a bit like putting your house on Watford to win the Premier League, because what they have here is a portable electrostatic speaker. The benefit of electrostatics are lower levels of harmonic distortion and lots of detail, but to work convincingly they have to be about the size of a human adult. As the treVolo’s electrostatic drivers are smaller than our hands, we are rather dubious. Still, the treVolo is a striking design. Its wings and perforated fascia put us in mind of an intergalactic cheese grater. Safe to say it wouldn't look out of place in a modern home. On the lower back panel there's a charge point (battery life is up to 12 hours), auxiliary input and output, and a USB port. There are the usual buttons for power, Bluetooth pairing, play/pause and volume, as well as one for changing the sound mode. A green light signifies pure (“minimal equalisation”), red for warm (“richer sound with more bass”) and blue is vivid (“emphasis on lead vocals and instruments”). With the sound set to ‘pure’, we play Lau's Hibna. There's decent body to Kris Drever's acoustic guitar as it strolls through the intro, and it is expressive enough to set the pace for the rest of the piece. Aidan O’Rourke’s melody is buoyant enough on the fiddle, kept moving by the guitar and Martin Green on the accordion. There isn’t a huge amount of space in here, even with such a small-scale arrangement, and it doesn’t feel overly enthusiastic, but we’re not in yet in the realms of being uninterested. Switching modes to ‘vivid’ engenders a little liveliness, and helps separate the instruments somewhat by bringing out more of the fiddle. On busier textures and vocals, as in Morrissey's Kiss Me A Lot, dynamics, expression and space are all lacking. What should be an arms-open-wide flourish feels claustrophobic and limp. Moz's voice lacks focus, even in the ‘vivid’ mode that should throw it forward, and so dispenses with its usual force. It needs more space, more attack and better dynamics. While we were sceptical about the idea of a portable electrostatic speaker, we wanted it to succeed. For BenQ to have pulled it off would have been quite astounding. Sadly, we're left wishing they had just focused on making great sound rather than groundbreaking technological advances. Unless you've already fallen head over heels for its quite original design, we would suggest placing your money elsewhere until you can find space in your house for the real thing.